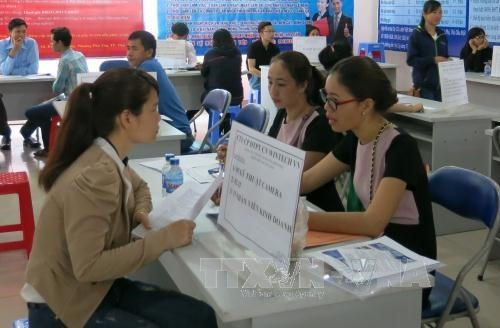 BÌNH DƯƠNG – Enterprises in Bình Dương’s southern industrial hub are seeking 22,700 workers to participate in a job fair held on Sunday. According to Nguyễn Thanh Phương, deputy director of the local job service centre, participating firms need over 22,700 labourers - 21,000 manual workers and over 1,600 professionals. The enterprises are offering over VNĐ5.5 million (US$240) per month to manual workers and a salary for professionals determined by the role and qualifications. Huỳnh Vinh Quang, representative of Phonak Việt Nam Company, said the company recruited new workers monthly to meet the company’s production demand. The company also had a policy to support a portion of tuition for workers’ children under 5-year-old, Quang said. Other firms attending the fair are also offering interesting supporting policies to attract more workers. Labour situation in Bình Dương Province has been relatively stable following Tết (Lunar New Year) festival compared with the previous years. This is the third fair held in the province so far this year. Located in the southern key economic region, Bình Dương is a leading Vietnamese industrial hub. Currently, industry makes up 63 per cent of the locality’s economy.